In an earlier post, I considered the logical implications one common view of replications: If you believe that any effect in the same direction as the original result counts as a successful replication, then you must also believe that any two-tailed hypothesis is non-scientific because it cannot be falsified. In this post, I further consider what effect sizes we should expect if the null hypothesis is true, and why that matters for how we interpret the results of a replication attempt. In the original thought experiment, a study found a significant effect with effect size of d = 0.5, but a larger replication found an effect size of d = 0.1. Some commenters argued that we should treat the second study as a replication because it produced an effect in the same direction. But, as I noted in my earlier post, even if the null hypothesis were true, that would mean replicating 50% of the time (Uri Simonsohn made the same point in a recent talk). Let's flesh that out a bit, because the problem is even worse than that. Even when the null hypothesis is true, we should not expect to find d = 0. Let's assume for a moment that the null hypothesis is true—you have two populations whose means and standard deviations actually are identical to infinite precision. Next, let's assume that you sample 15 people at random from each population, for a total sample of 30 participants, and you compare the means of those two samples. Remember, there is no difference between the populations, so the null hypothesis is true. (Note, I'm asking about the absolute value of the effect size—how big an effect would you expect to find, ignoring the direction of the effect?) Before reading further, if you had to guess, how big an effect should you expect to find? Answer: the median effect size in this case is approximately d = 0.25. If the null hypothesis of no difference is actually true, you'll find an effect larger in magnitude than d = 0.25 fifty percent of the time! In fact, you would expect to find an effect size bigger than d = 0.43 more than 25% of the time. In other words, you'll find a lot of spurious medium-size effects. Now, 15 subjects/group is not an unusual study size in psychology, but it is a little on the small side. What if we had 20/group? The median effect size then would be d = 0.21, and 25% of the time you'd expect to find an effect d > 0.36. Again, with a typical psychology study sample size, you should expect to find some sizable effects even when the null hypothesis is true. 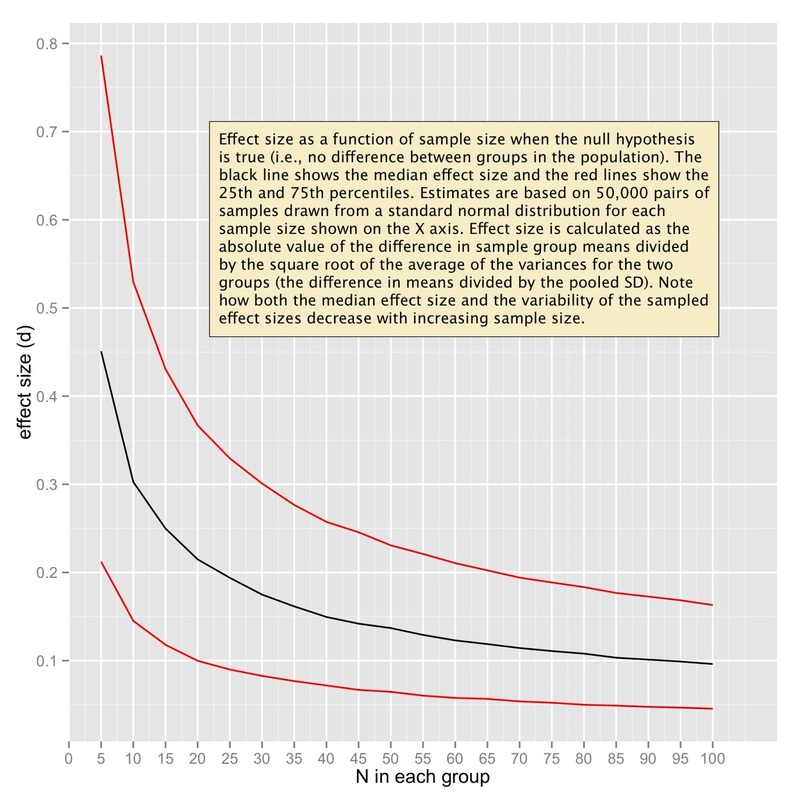 What if we had a large sample size, say 100 subjects/group for a total of 200 subjects? When the null hypothesis of no-difference is true, the median effect size would be d = 0.096 and more than 25% of the time the effect size would exceed d= 0.16. Here is a graph illustrating the median effect size (with 25% and 75% quartiles in red) as a function of sample size when there is no difference between the populations. In all cases, both groups are drawn from a standard normal distribution with a mean of 0 and standard deviation of 1, so the null hypothesis of no difference is true. (The values in the graph could be derived analytically, but I was playing with simulation code, so I just did it that way.) Note that small sample sizes tend to produce bigger and more variable effect size estimates than do large samples. What does this mean? First, and not surprisingly, you need a big sample to reliably find a small effect. Second, if you have a small sample, you're far more likely to find a spuriously large effect. Typical psychology studies lack the power to detect tiny effects, and even with fairly large samples (by psychology standards), you will find a non-zero effect size when the null hypothesis is true. Even with a large sample, an effect size greater than d = 0.1 should be expected, even when there is no real difference. So, for practical purposes in a typical psychology study, an effect size between -0.1 and +0.1 is indiscriminable from an effect size of zero, and we probably should treat it as if it were zero. At most, we should treat it as only suggestive evidence of an effect, and not as confirmation. Here is the press release from the Association for Psychological Science about the new Registered Replication Reports at Perspectives on Psychological Science. Note: I've replaced names with G+ profile links and added hyperlinks. Reproducing the results of research studies is a vital part of the scientific process. Yet for a number of reasons, replication research, as it is commonly known, is rarely published. Now, a leading journal is adopting a novel way to promote and publish well-designed replications of psychological studies. Perspectives on Psychological Science, published by the Association for Psychological Science, is launching an initiative aimed at encouraging multi-center replication studies. One of the innovative features of this initiative is a new type of article in which replication study designs are peer- reviewed before data collection. The new approach is designed to give researchers more incentive to pursue replications, which involve repeating a study using the same methods as the original experiment, but with different subjects. Scientists traditionally have garnered far more credit for publishing novel results rather than verifying earlier published findings. The goal of the new Perspectives initiative is to help make replication a valued part of daily scientific practice. Perspectives plans to begin publishing collections of replications of original studies conducted independently by multiple labs. Each participating lab will follow a shared, vetted, pre-registered, and publicly available protocol. Each collection of replications will be compiled into a single article (a “registered replication report”), and all researchers contributing replications will be listed as authors. In addition to providing input on the replication protocol, the author of the original article that was the focus of the collected replications will be encouraged to submit a short commentary discussing the final report. +Daniel Simons, Professor of Psychology at University of Illinois at Urbana-Champaign, and +Alex Holcombe, Associate Professor of Psychology at University of Sydney, will serve as editors for these replication projects. Published reports will be available without a subscription to the journal. And reports in the journal will link to more extensive information and data from each replicating lab on the Open Science Framework (OSF), http://openscienceframework.org/, a website that helps scientists store their research materials, collaborate with others, and share findings publicly. OSF is a signature project of the Center for Open Science (http://centerforopenscience.org/), a new non-profit opening this month in Charlottesville, Virginia. Founded by +Brian Nosek, Associate Professor of Psychology at the University of Virginia (UVA) and +Jeffrey Spies, a graduate student in Quantitative Psychology at UVA, COS aims to develop innovative practices and offer grants to scientists and journals to encourage replications of important research. This unique approach to publishing replications is part of broader efforts in psychological science to improve scientific practices. Psychological science is leading the way with initiatives that may have applications in other disciplines. Perspectives on Psychological Science is ranked among the top 10 general psychology journals for impact by the Institute for Scientific Information. It publishes an eclectic mix of thought-provoking articles on the latest important advances in psychology. Please contact Scott Sleek at 202-293-9300 or ssleek@psychologicalscience.org for more information. I'm excited to announce a brand new initiative at the APS journal, Perspectives on Psychological Science. The journal will be publishing a new type of article: the registered replication report. +Alex Holcombe and I will be acting as editors for these reports. Below is the mission statement explaining the goals and approach. And, here is a link to the Perspectives website with more information about the reports, the submission process, etc. Send us your proposals! The results of the replication attempts are then published together in Perspectives on Psychological Science as a Registered Replication Report. Crucially, the results of the replication attempts are published regardless of the outcome, and the protocol is pre-determined and registered in advance. The conclusion of a Registered Replication Report should avoid categorizing each result as a success or failure to replicate. Instead, it should focus on the cumulative estimate of the effect size. Together with the separate results of each replication attempt, the journal will publish a figure illustrating the measured effects from each study and a meta-analytic effect size estimate. The details of the protocol, including any stimuli or code provided by the original authors or replicating laboratories as well as data from each study, will be available on the Open Science Framework (OSF) website and will be linked from the published report and the APS website for further inspection and analysis by other researchers. Once all the replication attempts have been collected into a final report, the author(s) of the original article will be invited to submit a short, peer-reviewed commentary on the collection of replication attempts.